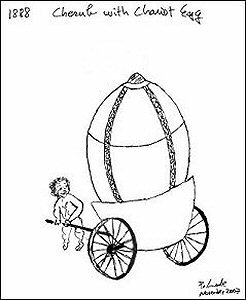 The drawings below of the Cherub with Chariot Egg, were made by Anna & Vincent Palmade to illustrate their november 2007 Fabergé Research Newsletter article about the discovery of this egg in an archival photograph of the von Dervis exposition in Saint Petersburg in 1902. 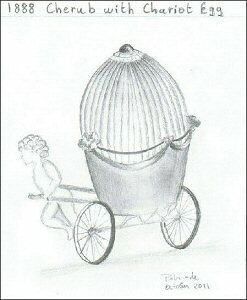 With their permission, the drawing was published on this website. 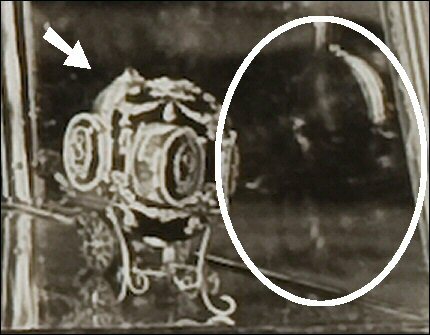 The drawing is designed based on the vaguely visible contours of this egg on the photograph of which below a detail. The tip of the egg is just left of the tip of the Caucasus egg. 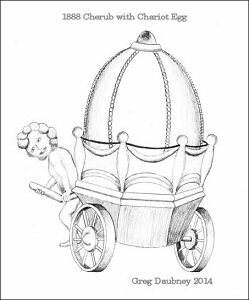 One wheel of the chariot appears just left of the Caucasus egg stand and the outline of the cherub pulling the chariot can be seen just above and on the left of the wheel. 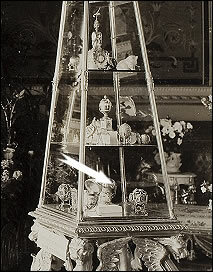 The overall outline of the egg can be seen on the reflection in the vitrine to the right of the egg. Read all about the research of the Palmades in their article on the Fabergé Research Site and see their drawings lower on this page. 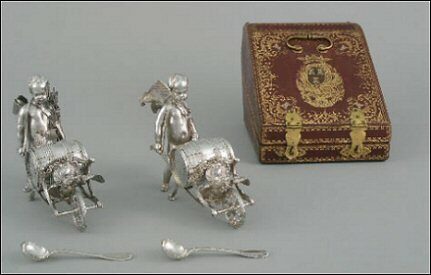 and Kieran McCarthy of Wartski provided the image below of a pair of mustard pots in the form of small boys pushing wheelbarrows containing barrels, executed for Madame de Pompadour in 1760, possibly after a model by Falconet. This might have been the inspiration for the Egg, according to McCarthy, as the Falconet reference is encouraging and will allow us to model the cherub. 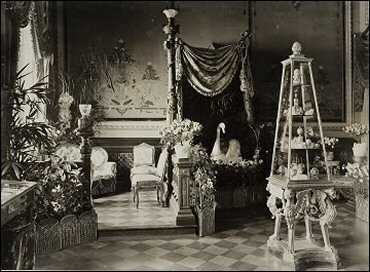 It seems likely Mrs Gunston, a rich New Yorker, bought the item from Armand Hammer's 'Hammer Collection of Russian Imperial Art Treasures from the Winter Palace, Tsarskoye [sic] Selo and Other Royal Palaces' exhibition at Lord and Taylor's department store in New York, held from November 3-December 1, 1934. 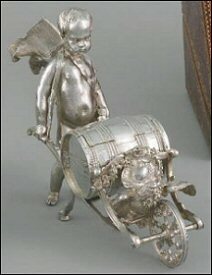 The item was listed as Lot 4524 in the Hammer catalogue and was described thus: "Miniature silver amour [cupid] holding wheelbarrow and Easter Egg, made by Faberge, court jeweler. From children's half of the Alexander palace. Inventory no. 935." Possibly sold in the 1930's to Armand Hammer. Whereabouts unknown, possibly United States.